Depending on what breed(s) you have, your hens might not be inclined to brood. You can still hatch their eggs, or fertile eggs from another source, using that marvelous invention: the incubator. If you do have hens that brood, should any ill befall a setting hen, you may be able to save the eggs; warm up the incubator, there’s a chance you can hatch them. An incubator also allows you to hatch chicks any time of year. There are many kinds of incubators, but all will be either still air, without a fan; or forced air, with a fan. The perfect internal temperature for the eggs is 99.5 degrees Fahrenheit. It can fluctuate a little, but not much. Embryos will die at 103°F. With forced air, the temperature should be 99.5°F. For still air, 102°F at the top of the eggs. The temperature will vary; the top is warmer than the bottom. The temperature inside the eggs would be very close to 99.5°F. The bare basics, regardless of incubator type, are these: You keep the eggs warm for 21 days. The first 18, eggs need to be turned several times a day. Humidity should be around 45-50%. 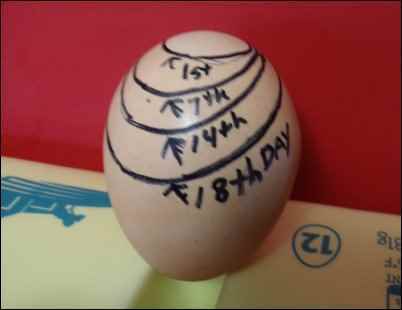 On day 18, stop turning them, increase the humidity to 55-60%, and wait for them to hatch. The most common home-use incubators are Styrofoam. I’ll use those for reference. They’re available at farm supplies, big-box stores, and online. Fan kits change still-air incubators to forced-air incubators. This eliminates hot and cold spots, and reduces temperature variations. If your incubator does not have a fan, you’ll also need to rearrange the eggs periodically. This way, they all get moved in and out of warmer spots and cooler spots. Hens do this all the time. A little temperature fluctuation is fine, if none are too hot, and none get too cool for too long. This one has a fan kit installed, just inside the heating element on the right-hand side of the lid. Through the screen, you can see the 3 water channels in the bottom, rectangular in the center, and a straight groove on either side of that. Turning the eggs keeps the embryos from sticking to the shell and becoming deformed or injured. Automatic turners slowly tilt eggs from side to side, 24/7. They’re essential if you can’t be home to tend the eggs. Make sure larger eggs won’t hit anything (like the fan housing) as the turner changes position. Old-style egg turner. The newer ones have different holders for the eggs. I leave out some egg cups to make room for the thermometer and hygrometer on the rail. For hand-turning, lay the eggs on their sides, and roll them from one side to the other. Mark one side of the egg with an “X”, the other with an “O”. Place them with the “X” up, then when you turn them, put the side with the “O” up. Turn at least 3 times a day, 5 is better. You can turn more often, but not less. Pick an odd number of turns per day. That way, the side left up overnight will alternate each day. Don’t crowd them, there should be a little space between eggs. Another way is to put them in an egg carton (big end up, always) with the carton top removed. Use carton top as a tray under the other part, so it’s more rigid. Put a prop under one end so the eggs are tilted. To turn them, move the prop to the other end so the eggs tip the other way. This tilts the eggs almost as far as a turner. Push the tops over toward the low side, so they tilt as far as possible. Alternative to an auto-turner, and easier than leaving the eggs lying down on their sides. Just keep the high side away from the heating element. Eggs won’t always stay the way you want them to on that wire screen that comes with the incubator. They roll, and sometimes they won’t stay put with correct side up. I put a layer of non-slip mesh shelf liner (this is optional) in the bottom. You can bunch it up just a tiny bit next to an egg that wants to roll, to keep it in place. It’s also a shock-absorbing surface, which helps protect the eggs if you drop one. The thicker mesh, with larger holes, is best. It provides better padding, and the larger holes provide better air flow. Since I started using a turner, I don’t put mesh in until the last three days, when the turner’s been removed. You need a draft-free place to put your incubator, out of direct sunlight, where the temperature is fairly stable, and it won’t be bumped or knocked over. Incubators don’t use much power. Mine uses 48 watts, including the fan kit. Heat cycles by thermostat, so if the room is around 70-75 degrees, it won’t use much power to maintain 99.5F. Turners draw only 3-5 watts. If you want a back-up for outages, a car battery, kept charged by either a solar charger or a plug-in rickle charger, paired with an appropriate inverter, should keep it going through an outage. Many home solar- or wind-power systems will support an incubator. 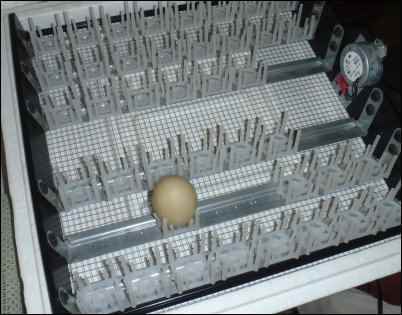 Make sure the incubator is clean. If you bought a used one, it should be washed and sanitized before using, even if it looks clean. Wash the bottom with warm, soapy water and rinse well. A 10% chlorine bleach solution can be used to disinfect it. The top is harder, with recessed areas and electrical parts. “Canned air”, a rubber squeeze bulb, or a compressor with an air nozzle (not too much air pressure! ), can remove dust and chick-down from the recesses in the lid. The interior can be wiped down with a bleach solution, or hydrogen peroxide. Don’t get the electrical parts wet. Another way to disinfect the incubator after you’ve cleaned it, is to place it outside, open, with the interior sides up, in direct sunlight for a day. Don’t do this when it’s windy, your incubator could be blown away. Put all the equipment you’re using in place, put the lid on and plug in the power, including the turner if you’re using one. Place the thermometer/hygrometer where you can read it through one of the windows in the top of the incubator. Let it run about 4 hours, and check the temperature. If it goes above 99.5, turn the heat down very slightly, wait a few hours, and check again. Don’t turn up the temperature control, unless it remains too low after 8 hours. When the correct temperature is attained, wait at least 4 more hours before adding the eggs, to make sure it remains stable. The exception to this timetable is when you’re trying to save a batch of eggs from an ill-fated broody, and time is critical. In that case, you’ll just have keep your fingers crossed, and check often until you’re sure the temperature is stable. When you add the eggs (which should be at room temperature), the temperature will drop. That’s normal. The eggs will take several hours to warm up. Don’t increase the temperature. It will return to the set temperature. Incubator controls are notorious for being touchy. It’s easy to cause a lethal temperature spike, with even a tiny adjustment. It’s best not to turn up the control knob unless you can check it hourly for several hours, and never during the initial warming of the eggs. Temperatures will drift slightly, (mostly less than 1/2 of a degree) due to changing room temperature, drafts from opening and closing the door to the room, from opening to turn eggs, and so on. If your initial setup was done correctly, the temp will be 99.5 the majority of the time, and that’s fine. However, if the temperature increases more than 1 degree above the correct range at any time during incubation, turn it down very slightly, remove the lid for about 5 minutes to cool it a bit, replace the lid, and check every half hour to make sure it doesn’t get too hot again, until you’re sure it’s stable. Most incubators come with a spirit thermometer, (that’s the kind with the red fluid inside) stapled to a plastic card. They sometimes slide in the staples, so you can’t tell what the temperature really is. A way to solve this problem is to put a thermometer that you know to be accurate, side by side with the one that came with the incubator, and when you know what the temperature is, slide the questionable one so the readings match, then place a drop of glue under the bulb to stick it to the card in the proper position. Whatever type of thermometer you choose, check the accuracy before you use it for incubating. If you get a temperature increase above the safe range, not caused by adjusting the knob, you may have a defective thermostat. If it’s a new incubator, contact the manufacturer, see if they’ll send you a replacement. An easy home-made candler, goose-neck lamp and a coffee can lid. Darken the room to see the inside of the egg. Remember that it takes longer for inside of the egg to warm up than it does the air, and that gives you a little wiggle room for adjustments. If the temperature gets too high, don’t panic. Adjust the temp, and carry on. You may wish to candle in the next few days. 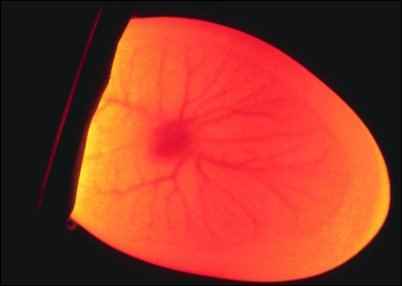 If you still see blood vessels, whether you can see movement or not, they’re ok.
Candling is simply shining a light through the egg, to see what’s inside. 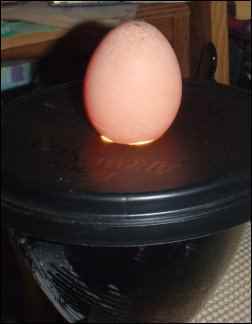 I candle to select eggs with good shells, and periodically during incubation. It’s optional, unless you’re using air cells to check humidity, which will be explained later. It’s nice to know what’s going on with the eggs. At 3-4 days, you can see an embryo. It looks like a little dark blob, with blood vessels. Often, you can see it moving. Embryo on 4th day of incubation. Once in a while you won’t see the embryo that early, especially with very dark brown or green eggs. Green eggs can be very hard to see into, sometimes harder than dark brown ones. At 12 days, there’s a large dark area, mostly on one side of the egg. You should still see veins, particularly near the air cell. Remove any that aren’t developing. At 18 days, you’ll see almost nothing but air cell and a big dark area. This is good, because the egg is full of chick. You may see a small clear area at the small end, that’s normal. This late, if unsure whether an egg is still alive, leave it in the incubator. An egg you thought was a goner might surprise you and hatch. At any stage, if there’s a bad smell, sniff out which egg and remove it immediately. Put a plastic bag over it to pick it up, in case it breaks. There are plugs for the top ventilation holes. They restrict air flow. This can increase the temperature and humidity, but it also decreases available oxygen. Better to use the thermostat to adjust the temperature, get it right before you add the eggs. Use water to increase humidity, if it needs to be increased at all. Styrofoam incubators have molded bottom channels to pour water in, right through the screen. Whether you need them depends on how humid it is where you live. When I add water to mine, I put a jar lid in the incubator, with a square of new sponge in it, under one of the vent holes so I can drip water in with a dropper or a drinking straw. This is easier to control, and easier to remove if it gets too humid. You don’t need to check humidity the first 24 hours. Then, until the 18th day, the humidity should be between 45% and 55%. For the last 3 days, just a little higher. 60% has worked well for me. Some advise hatching at higher humidity, some lower. My hatch rate has been better with this range of humidity. The chicks shouldn’t stick to the shells, and should be damp when they hatch, not wet. The markings show the growth of the air cell during incubation. 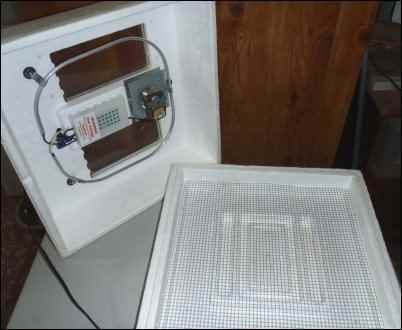 The easiest way, though, to monitor the humidity is to use a hygrometer. There are many available online. Like thermometers, there can be problems with accuracy, so it’s good to test it. You can test your hygrometer by placing it beside a teaspoon of damp table salt in a bottle cap. It only takes a few drops of water, you just want damp salt, not a saline solution. Don’t let them touch, salt can damage the hygrometer. Seal the container, with some air trapped inside. Let it sit at room temp overnight. Check the reading without opening the container. It should read 75%. If it doesn’t, check the manufacturer’s instructions for adjusting the calibration. Most have a small set screw on the back. Because I live in a region where it’s humid in the summer, I normally use what’s known as dry hatching, which is incubating without adding water to the incubator. 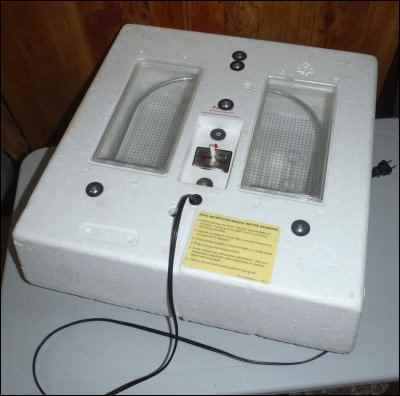 In dry hatching, if the humidity is too high, you can lower it by increasing the air flow. There’s a ridge all the way around on the Styrofoam incubators, between the top and bottom. I place cotton swabs across the corners, up against the ridge. This opens a small gap between the top and bottom. It lets in more air, but not enough to drop the temperature. Swab-stick placement to increase airflow. The swabs lift the lid very slightly improving air flow and lowering humidity without chilling the eggs. Day 18 arrives at last, you stop turning the eggs, or remove the turner if you’re using one, increase the humidity if needed, and now all you can do is wait. On day 21, little holes appear in the shells, near the big end. This is called pipping. Next, the line pecked all the way around the top of the egg, is called zipping. Then they will push their way out. It’s best that you do not interfere with this process. Too often, attempts to help the chick get out of the shell will result in a dead chick. Sometimes they just aren’t quite ready to come out. The yolk-sac may not be absorbed yet, there may still be an opening from the abdomen. The umbilical vein may not have sealed off yet. It can take 24 hours or more from pip to hatch. Once the hatching starts, keep an eye on the humidity. Lots of moisture is released when the chicks emerge, it can quickly become too humid. When chicks have fully dried and fluffed out, are on their feet and scampering around easily, it’s time to move them to the brooder. This can take several hours. Typically, the first chicks out of their shells are ready for the brooder while others are still hatching. These two were the last of that hatch, ready to join the rest in the brooder. You can see the hygrometer, and my old outdoor thermometer. I started using it because the large numbers are easier to see through the incubator windows. Taking out the more active chicks can prevent losses in ones that hatch later, because the early chicks often start pecking at the ones that are still hatching, and may cause injuries. At bedtime, some chicks may be hatched, but not ready for the brooder. I cover the windows of the incubator to keep it darkened. Then they’ll sleep most of the time, and won’t cause trouble before I get back to them. Get a brooder box ready before they hatch. A big plastic storage tub, with expandable metal screens over the top works well. 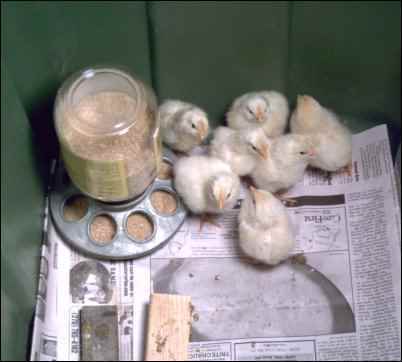 You may have something else around that you can use for a brooder. They need a bottom liner you can take out and replace, something that gives them a little traction is best, it helps prevent leg injuries. Old towels, t-shirts, something you don’t mind throwing away when you’re done. They only need it a few days, just until their legs are a little stronger, then plain newspapers are fine. 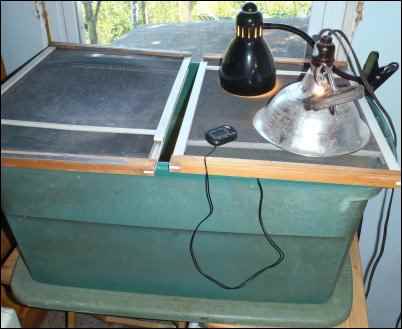 Brooder box with screens and lamps. Turkey poults in the brooder. The feed and water-trays that screw onto quart jars work well. They’re cheap, easy to use and clean, safer and cleaner than open pans. When moving chicks to the brooder, gently dip each chick’s beak in the water. Don’t worry about the food, they’ll find it. They are intensely curious and peck at everything. 3-day old chicks in the brooder. They need a heat source. I place one or two clamp-type lamps right on the metal screen. Incandescent bulbs are getting harder to find, but there are non-light heat bulbs available (look in reptile accessories) at pet supply stores and online. They need around 14 hours of light per day. 24-hour light is fine if that’s the heat source. Put the heat source at one end, and the food and water at the other. When they aren’t eating and drinking, they’ll gather under the heat, and sleep there. That keeps the feeding area a little cleaner, and gives them a dryer sleeping area. Let the chicks tell you how much heat they need. If they move as far from the heat as they can, it’s too hot. If they’re piled up, or huddled together, they’re too cold. If they’re scattered more or less evenly, they’re just right. Adjust the heat by raising or lowering the lamps, and by draping towels over the rest of the screen to hold more heat in. 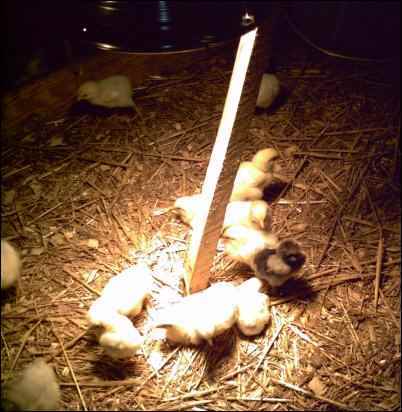 Chicks moved to the henhouse nursery, heat lamp clamped to the perch support. You’ll need a place to move them before long, anytime from 3 days to a week, so they don’t get too crowded. 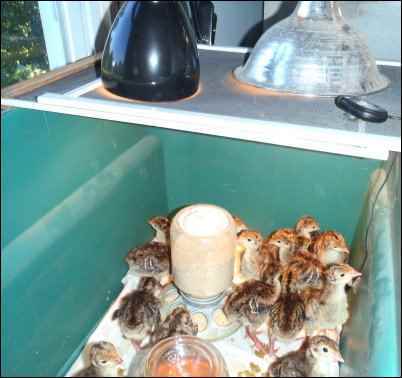 They’ll need heat for awhile, and they’ll soon need a larger feeder and waterer. 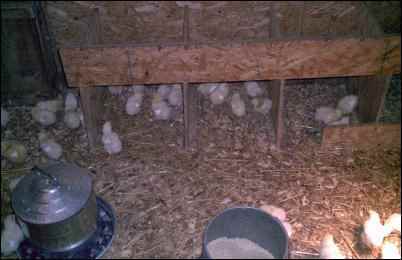 I have a section of my hen house where I can confine chicks until they no longer need the extra heat, and can join the rest of the flock. Chicks enjoying having more space to run around in the henhouse nursery. Note the gravel in the water tray, so they can’t wedge themselves into it. Have fun, and enjoy your new chicks. Be forewarned that hatching chicks is addictive. You may find yourself hatching chicks more often than you’d intended.